Luxury Home, Family Friendly, 4900 Sq Foot, 6 BR Ski in/Out! Welcome to Paradise. Breckenridge Splendor is a family friendly home that lives up to its name both with its incredible views of Mt. Baldy and its luxurious interior furnishings. This house features two large family rooms with beautiful rock fireplaces on each level. The lower level also has an open wet bar and a Bose surround sound stereo system. The master bedroom features a California sleep comfort king size bed, a private balcony with a spectacular view of Mt. Baldy, and a large stunning master bathroom with copper inlaid tile, Jacuzzi jetted tub and a separate shower. The house is located in Warriors Mark, an exclusive, friendly neighborhood right next to the Peak National Forest. It is just a short distance to put on your skis and ski to the Beaver Run Chair Lift on Peak 9. The house is located in an exclusive, friendly neighborhood right next to the Peak National Forest. It is a short 75-yard walk to put on your skies and ski to the Beaver Run Chair Lift on Peak 9. You will ski out on Peak 9 and can come back on either Peak 9 or 10 based on your ski level. Green skiers can do Peak 9. Enjoy your Rocky Mountain vacation in this beautiful home that can comfortably sleep 17. There are plenty of warmly decorated rooms to accommodate your group during day and night. The gorgeous great room with a large rock gas fireplace, and access to the hot tub, can easily seat 10/12. There is also a separate living room for additional adults or kids. This warm, open design with over 20-foot ceilings makes it perfect for large families. And if you want to go out, there are many fine and delectable restaurants to choose from. The gourmet kitchen with hardwood floors and granite counter tops is fully stocked to meet all of your cooking needs. The large table in the adjoining dining room seats 10 and is the perfect place to relax and rejuvenate after your day of skiing or hiking. There is additional seating (up to 4) at the granite kitchen bar/counter top. That's a favorite place to enjoy your apres' ski glass of wine while cooking a family meal together. The main level, master suite features a king bed, large windows, access to the hot tub, and a luxurious master bathroom with Jacuzzi jetted tub and separate shower. There is an additional bedroom with a queen bed on the main level. The lower level has 3 additional warmly decorated bedrooms along with a game room for both kids and adults to enjoy. A day of activity in the mountains is never complete without a dip in a hot tub. Enjoy our large, new hot tub surrounded by Lodge Pole pine trees on one of the two outside decks. 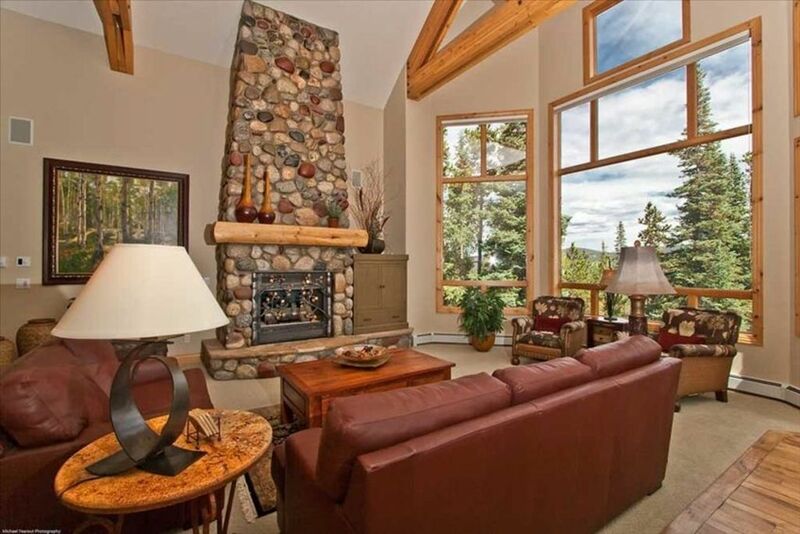 Breckenridge Paradise will be perfect for your next Ski or Rocky Mountain Vacation. We hope you enjoy our home as much as we do! Game Room - 2 Bunk Beds. One has a double and room sleeps 5. Keyes and Carole Townsend have been calling Colorado home for the past 25 years, following a 20-year Air Force career. They feel blessed to have such a beautiful vacation home in Breckenridge, CO, that they enjoy on a regular basis with their 5 children and 7 grandchildren. They live in Colorado Springs where Keyes and Carole run a highly successful Orthodontist practice. They're pleased to share this beautiful mountain retreat with others, so they can enjoy everything our lovely state of Colorado can offer. We fell in love with Breckenridge. A real town with a lot of history that was open with a lot of fun activities in both the winter and summer. A true luxury home, located in an area of million dollar homes next to Peak 9 and below Peak 10. View of Peak 8 and 9 and Mount Baldy. About a 75 yard walk to put on your skis. Ski home from Peak 9 or Peak 10. About a 75 Yard walk. Note, AC does not exist in most private homes in Breck. In August, it gets down to 55 degrees at night. Warmy and cozy radiant floor heating. Pots, Pans, Plates for a large Thanksgiving or Holiday feast. About 5 miles away is the Breckenridge 27 hole golf course. Large Roomy private hot tub. Amazing property. Beautiful views. So much room for the family of 15. We had a group that included individuals from the age of 2 to the age of 70. This property fit the needs of everyone. Had 10 guys on our annual ski trip. Lots of room to spread out. Kitchen very well equipped. Shuttle service ran very 15 minutes so easy ride down to Charter Sports where we got our equipment and then could leave it overnight. Bill was really nice to work with providing lots of info about Breckenridge. Would highly recommend. The house is beautiful, was decorated for Christmas including a tree, and very convenient location. This was a Christmas family reunion for our 3 girls and their families. We had 10 adults, 2 teen girls, 2 toddlers, and a 5 month old. There was plenty of room for everyone. The kids especially loved the basketball game, ping pong, and foosball. We never had a problem with the Flologics water shut off. The hot tub was so welcoming after a day in the snow or on the slopes. There are lots of appliances ( KitchenAid mixer, hand mixer, blender, lots of pots, pans, waffle maker, counter top grill, bowls, spices, flour, sugar, more staples in the pantry). The fireplaces work very well to warm heart and home. The view is spectacular from the main floor across the valley. The extra frig in the garage was nice for our large crowd - extra drinks and food. There were sleds available, tho we brought our own. Charter Sports provided exceptional service for all levels of skiers/ snowboarders. The short walk to the free shuttle was convenient. We used it often. Bill was very accommodating and informative before our arrival and was quickly able to resolve a towel shortage. We would highly recommend this property and if we have an occasion to have a large group, we would book it again. a drive and up a steep hill. The home had everything we needed including a pak n play. a little way down the road where we caught some trout. We would stay here again. Perfect accommodations for 12 + 2 young kids! The house was perfect - accommodated 12 + 2 kids with no trouble - and the kitchen with spices, etc. was great - I know we added to the pantry as well! We did see two moose out back one morning after 8 inches of snow. And - the sleep number bed was just like the one we have at home - perfect! We used the Warriors Mark West shuttle for ski access as well as going into town - day and night. It was extremely convenient. Able to check skis at Charter overnight - easy access in the morning! We had a family reunion at Breck Splendor and enjoyed it tremendously! There were 16 of us and plenty of space for all--infants to retirees. The home is beautiful and included all amenities. The kitchen was completely outfitted for all of the cooking and snacking we did. The skiing was perfect and we enjoyed Breckenridge. We recommend the Children's Museum if you have young ones. We'd love to return some day. Breckenridge Paradise is a beautiful ski in and out, 6BR home located in Warriors Mark West, next to Peak 9 and below Peak 10. Sleeps 17 in beds.